The Libyan people are right to celebrate as their country’s benighted Muammar Qaddafi era comes to a definitive close, but the country’s new leadership should also not forget that its work is just beginning. Building a new political order will be difficult, not least because Libyan political culture is notoriously underdeveloped, with only the barest history of civic engagement. However, if the leaders of the Transitional National Council prove to be as politically canny as they were physically brave, they’ll soon realize that their national vice is actually a potential virtue. Outside observers often ridiculed Qaddafi’s erratic policies and mocked his grandiose rhetoric. Others doubted his sincerity. But what his critics never seemed to grasp was that Qaddafi was a true believer in the revolution he advocated. He yearned to transform Libya, a country that had been the world’s poorest as recently as 1951, into a modern state that would become a regional power. Unlike other Arab authoritarian figures such as Iraqi President Saddam Hussein who could threaten to “burn half of Israel,” while secretly approaching the Jewish state to sell him military drones, Qaddafi sincerely sought to implement the political vision he promoted. Qaddafi’s greatest problem was that hardly anyone in the society he wanted to lead could be moved to follow him. Qaddafi intended to use Libya’s oil wealth to buy the country the modernization and power he coveted. But above all, he sought to mobilize his people to action. He wanted to instill them with the revolutionary zeal that he felt so keenly. The Libyan people refused. Qaddafi’s first focused his ire on the country’s professionalized civil service. Qaddafi believed that comfortable and stable civil servants would be inherently too cautious and sluggish to implement his designs and thereby inspire the greater public. His solution was to bypass the bureaucracy entirely, and appeal to the masses directly. To that end, he created an elaborate power pyramid which he explained as “the masses organized through the popular congresses are the ones who own authority.” In devolving the reins of government to the people it was created to serve, Qaddafi hoped to prod his people to apply his ideals. But again, the Libyan people were mute in response. Qaddafi’s regime was a hollow shell of an order, in which few believed in the prevailing political system, and hardly anyone professed otherwise. But, in truth, Qaddafi’s grand political designs for Libya were frustrated not by a listless bureaucracy or the foreign imperialists he claimed were bent on his destruction. Instead, it was the people he claimed to dearly cherish who prevented him from realizing his dreams. Qaddafi was obsessed with mass mobilization, but his people had little common history as a coherent nation, and they felt little common purpose. It is with good reason that the acclaimed American foreign correspondent Edward Sheehan described the Libyan people as “torpid and fatalistic, xenophobic and dour above all”. Lacking a sense of shared destiny, the disappointments of the vast majority of Libyans rarely rose to the level of passionate anger, much less to that of committed civic engagement. That problem has only gotten worse over time: Reared on the oil wealth that is their birthright, Libyans now primarily think of their state as a way to satisfy their material needs. More than 60 percent of the country’s labor force works for the state; 250,000 of them are paid for jobs they do not perform, according to American diplomatic cables released by Wikileaks. Libyans fail to mobilize because there is no need to do so. The rentier state, by lavishing its oil wealth, has rendered them listless. 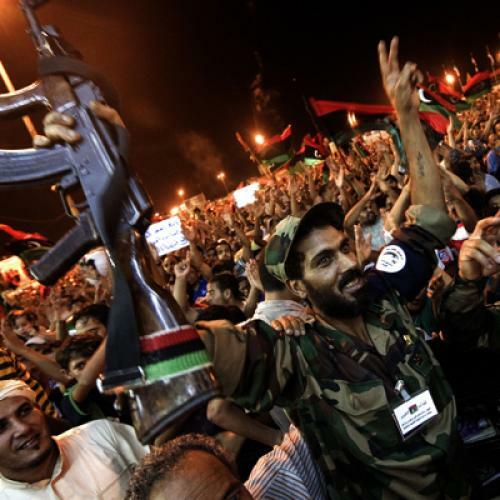 Unsurprisingly, Libyans have not moved quickly to capitalize on their newfound freedoms. In the six months since the start of their revolution, only two political parties have been established. Most Libyans have been content to enjoy their partially victory, exhibiting scant interest in creating a new political system. Such behavior is not puzzling in a country where political parties have been banned since 1972. But Qaddafi’s successors in the National Transitional Council (NTC) would be wise to realize that the strongman’s bane will be their boon. Qaddafi’s despised Libya’s political indifference, its refusal to expect anything of its leaders beyond monthly paychecks and its equal refusal to offer anything back. But for the rebels marshaled against him, these shortcomings afforded them the time and patience they needed to overthrow Qaddafi. Those Libyans living in rebel-controlled areas for the past six months have tolerated the new leadership’s stumbles and missteps. For Libya’s new leadership, the nation’s deep-seated patience will continue to be a tremendous opportunity, even if it’s largely a product of indifference. It is fortunate that Libyans are not expecting a perfect system of government, because they are not likely to receive it. They have already endured the hardships of war without protesting against the increasingly Spartan conditions it imposed. They are also sure to endure the uncertainty that the next few months will bring.